There was a certain amount of trepidation going in to this fixture. I was still seething about the non-performance in the cup on Tuesday. Actually I was still seething about the horror of the final game of last season when we played the same team and our players were already on holiday. This history was of particular concern as my niece, Amelia, who has been coming to games on and off for years was accompanying me. I am still haunted by her distress at the end of the last play-off final, so I was hoping that the lads would give her something to smile about. When the team news came in, there were two changes from the win over Leeds with Anya coming in for Paredes and Ekstrand coming straight back after serving his three match suspension, which seemed very harsh on Hoban who had been excellent. So the starting line-up was Gomes, Angella, Ekstrand, Tamas, Pudil, Abdi, Tözsér, Munari, Anya, Deeney and Forestieri. I noted the presence of a Sinnott on the Huddersfield bench, who did turn out to be the son of former Watford player Lee. The news during the week of Troy Deeney’s new contract had been a delightful surprise as I had resigned myself to his departure. Needless to say, he was given a tremendous reception and, in turn, showed his appreciation to the crowd who sang his name. The first action of note was on the sideline as Angella challenged Coady who went sliding off the pitch and collided with Beppe Sannino in his technical area (for once) sending him flying. There were no histrionics from the gaffer who was immediately back on his feet and it was nice to see that his well-being was checked by both Coady and the Terriers boss, Lillis. The first attempt on goal came from the visitors as Harry Bunn cut inside Angella but shot high and wide. Then Vaughan put a header over the bar. Forestieri had the ball in the net having broken forward while avoiding the attentions of Wallace, but the linesman was flagging. Fernando was not deterred as he went on a great run, evading a couple of tackles before being taken down on the edge of the box, the ball broke to Deeney who played it out to Anya running in from the right, but his shot was wide of the far post. 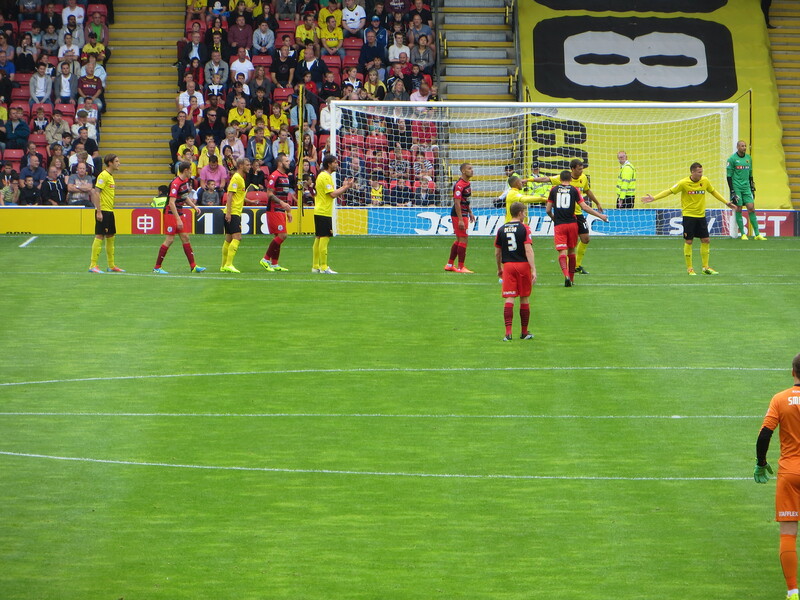 Deeney had a great chance to take the lead as he connected with a Tözsér free-kick, but he directed the header just over the bar. At the other end, a corner was punched clear by Gomes. On 15 minutes, we were ahead as Tözsér played a fabulous through ball to Deeney who sprinted clear and shot past Smithies. What a perfect way to celebrate his new contract. Five minutes later, Troy muscled Coady out of the way and bore down on goal again, but this time his shot was into the side netting. Pudil tried to catch the Huddersfield defence out with a quick throw to Forestieri whose shot was deflected for a corner. 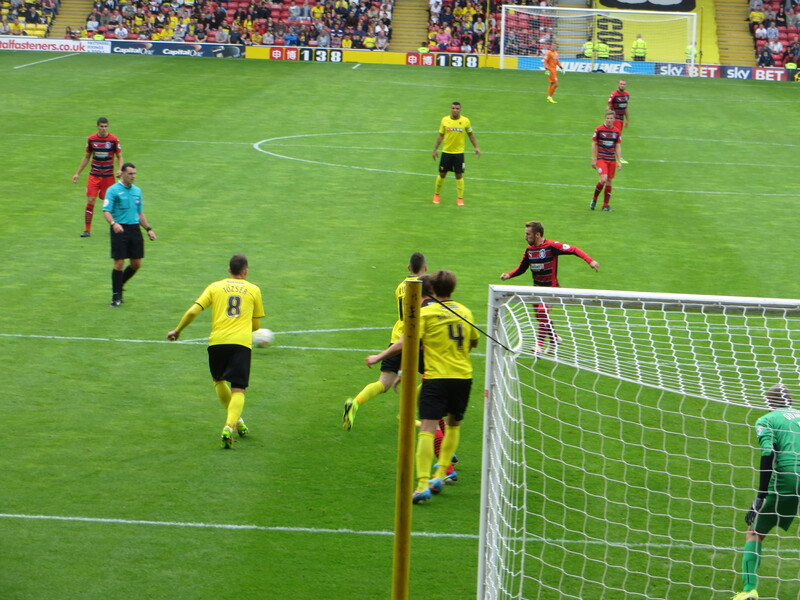 It wasn’t all Watford, though, as Majewski tried a shot that Gomes dropped to push clear. Then Tamas lost the ball to Majewski leading to a goalmouth scramble as first Butterfield’s shot was blocked, then Coady’s attempt was parried by Gomes, the ball finally dropped to Vaughan who beat the keeper, so it was a relief to see the linesman’s flag raised. On the half hour, Deeney headed a ball back to Forestieri who tried a shot from distance that was easily gathered by Smithies. Butterfield tried another shot that Gomes was down to gather. Scannell snuck in behind Pudil and put in a low cross that flew across the goalmouth but no Huddersfield player was there to get the vital touch, so it was cleared. Munari was the first Watford player to be booked as he knocked Lynch to the ground. 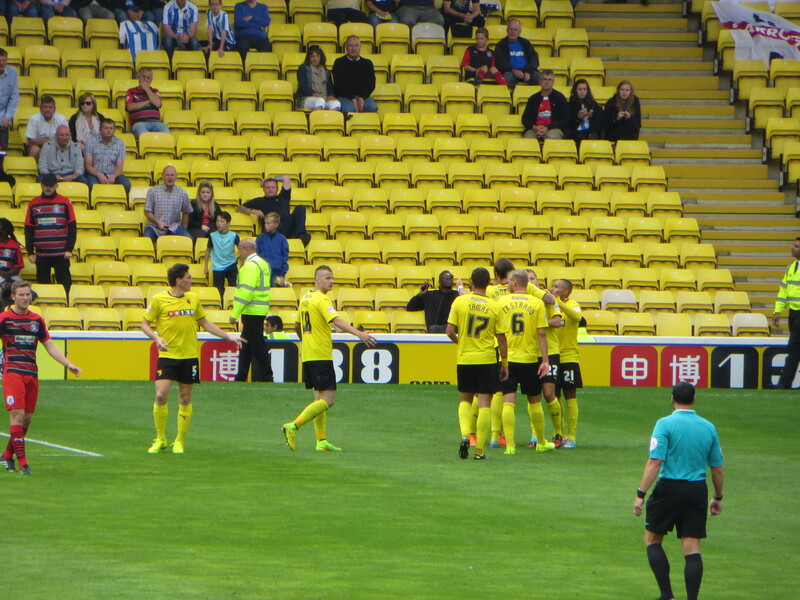 We had another great chance as Pudil found Deeney in the middle and we were waiting for the net to bulge in front of us, but Troy’s shot was just wide. Tamas played a long ball to Pudil who crossed to Forestieri who played the ball over to Anya whose snap shot was caught by Smithies. Just before half time, Tamas played a lovely cross into the box for Forestieri who came flying at it and headed just over. Then Anya found Deeney who also shot over. Munari had pulled up a few minutes earlier, so it was sad to see him limping off to be replaced by Andrews. It had been a lively and enjoyable first half. Huddersfield had their chances, but Watford had played some lovely football and really should have been further ahead. 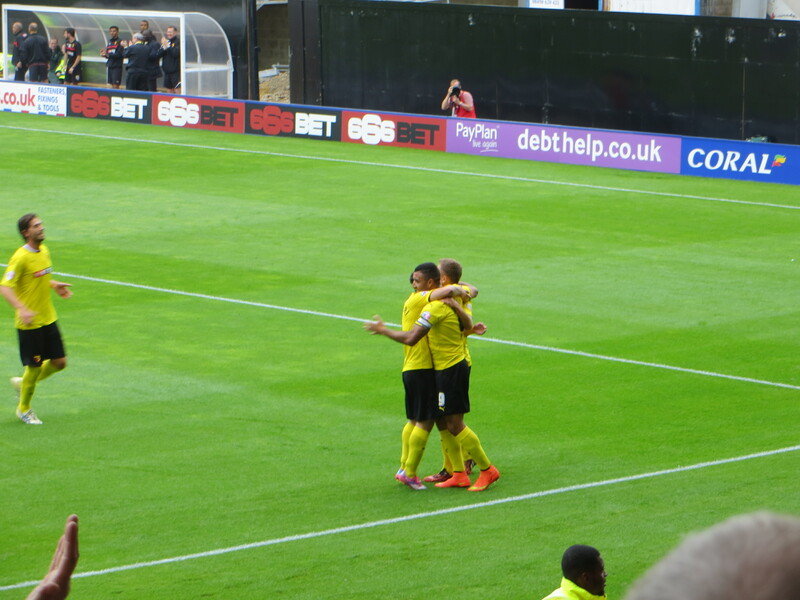 I have to say that watching Deeney and Forestieri playing together in that half, in the knowledge that this was not the last time I would see Troy in a Watford shirt, had been an absolute joy. The second half started horribly for the Hornets as there was a mix up between Tamas and Gomes over a ball into the box, it broke to Bunn who buried it past Gomes and, for some inexplicable reason, decided to celebrate in front of the Rookery. Soon after, Dixon tried a speculative shot from distance that was well over the target. We were ahead again in the 53rd minute as the ball broke to Abdi in the box and he powered it past Smithies. Huddersfield continued to threaten. Gomes dropped to gather a shot from Majewski. Then a Scannell cross appeared to be heading for the goal when Tözsér lifted a foot to flick it wide. Tamas was booked for what looked like a soft tackle on Bunn, who had spent a lot of the game on the ground. Vaughan got his head to a cross from Scannell, but Gomes pushed it wide. Unfortunately, from the resulting corner, Wallace had a free header to restore parity. As if that wasn’t bad enough, within a couple of minutes we were down to 10 men as Tamas made an unnecessary tackle on the sideline which earned him a second yellow card. There was no danger in the position, so the tackle seemed utterly pointless. I am a fan of Tamas, but he had a mare during this game. There was also a booking for the visitors as Wallace saw yellow for taking Abdi down. 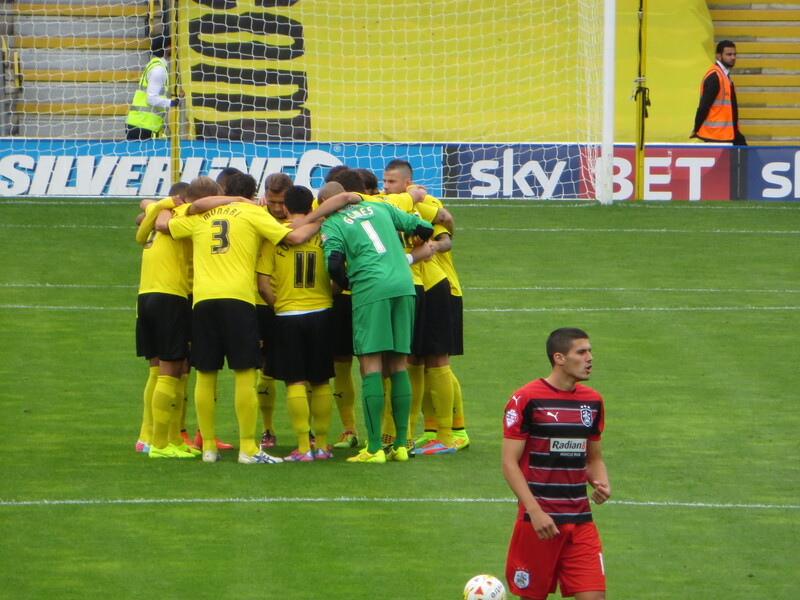 Almen took the free-kick himself, it was on-target but Smithies pushed it out for a corner. Abdi took the corner which curled deep and was headed in by Andrews to restore a slightly surprising lead for the Hornets. At the other end, the ball fell to Majewski but his shot was blocked. Majewski then had another shot that crept wide with Vaughan closing in. Huddersfield really should have drawn level as a cross reached Vaughan in front of the goal, but he cleared the ball instead of sending it goalwards. During this period of Huddersfield pressure, every time the ball came into our box, I could feel Amelia flinch. I was desperately hoping that we didn’t disappoint her again. Each side made a substitution with Vaughan making way for Wells and Hoban coming on for Anya to shore up the defence in the absence of Tamas. Huddersfield threatened again as a cross came in with Scannell sneaking in at the back post, but Pudil was there to put him off and he knocked the ball into the side netting. The final substitutions saw Hammill and Stead replacing Bunn and Dixon for the visitors with Paredes replacing Forestieri for the home side. Wells tried a shot from the middle of the box, which was caught by Gomes who was in action again almost immediately, dropping to stop a shot from Hammill. Then a ball came in to the Watford box with Pudil and Gomes both challenging for it and Pudil seemed to step on Gomes. They both went down and it didn’t look good, but the upshot was that Gomes had cramp which took a while to treat but he was able to continue. 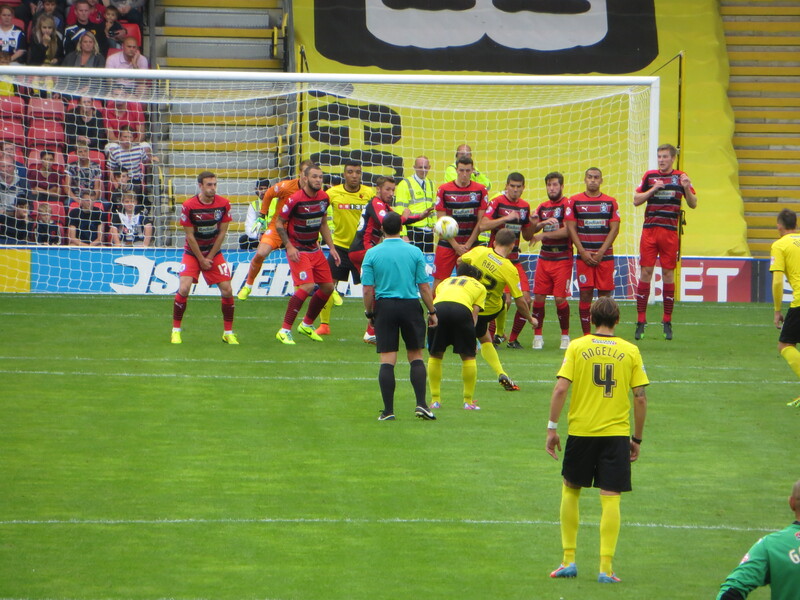 Huddersfield continued to press for a third equalizer as Bunn tried a shot from distance that was well over the bar. At this point something remarkable happened. There had been some encouraging chants coming from the Rookery, but I saw Tözsér gesture for us to raise the volume and the next thing I knew, the whole of the Rookery were on their feet singing and clapping. The same was true of the family stand. Then I turned to my left and saw something I have rarely seen before, the whole of the GT stand singing and clapping. As my attention returned to the pitch, I saw Gomes parrying a shot, Hammill followed up but Gomes was equal to it. 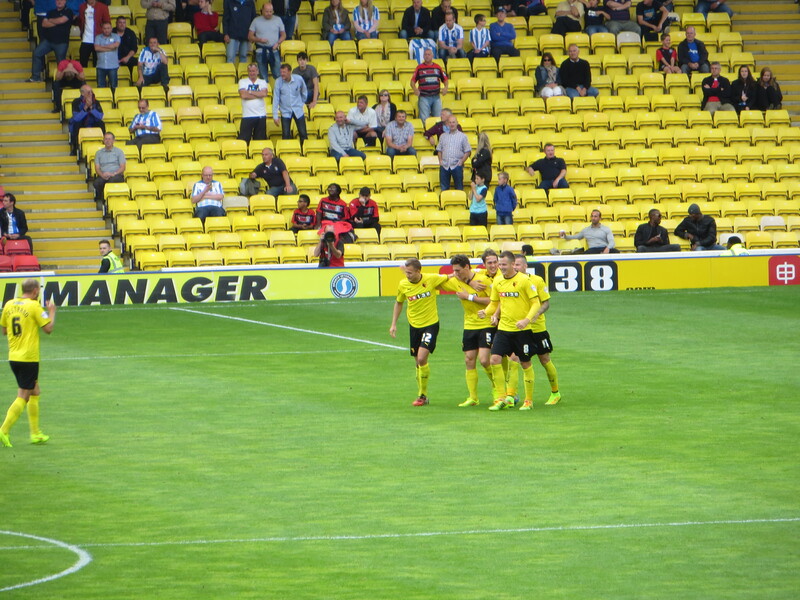 There were six minutes of injury time and the Vicarage Road faithful kept up the chanting for the team. Then Tözsér played a ball across to Abdi who advanced into the box and curled the ball around defender and keeper and into the net. At 4-2 in injury time, that had to be the winner. Cue a properly mental celebration. With the singing that had preceded the goal, I felt like I had earned an assist. But I nearly had heart failure when I saw my sister pointing. I looked at the lino whose flag was down and then realized that she was indicating the Gomes celebration, which was as mental as ours. What a relief! At the final whistle, there was a joyful celebration. When Tamas was dismissed just after the visitors had equalized, it looked like our afternoon was over, but this had been a tremendous performance both on the pitch and in the stands. One that we could all be proud of. 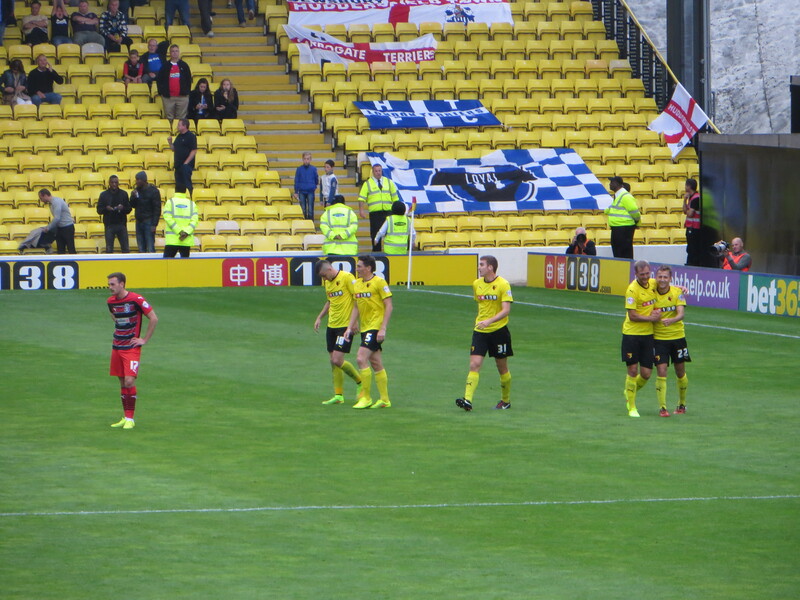 There was a nice touch at the end of the game from Deeney who threw his boots into the 1881. I am still struggling to understand what went on yesterday. On a normal Saturday at Vicarage Road, you will see a good number of people leaving to ‘beat the traffic’ even when we are drawing and pushing for a winner. In this game, we were already ahead and, while Huddersfield were pushing for an equalizer, this was only the 5th game of the season, so the result was hardly make or break. Despite that, this became one of those times when the players and fans become one team and the joy at the end of the game is something to be treasured. The best part of the afternoon for me was that Amelia went home happy. But this now makes her a lucky mascot so she will be invited back very soon. While I’ve been writing this report, the news of Beppe Sannino’s departure has broken. In my few encounters with Beppe, I found him a very engaging man, but I hadn’t always been a fan of the way his teams played. There were a lot of dreadful performances last season and the last encounter with Huddersfield was certainly one in which you felt that the players had no respect for the manager. That was also my impression at the end of season dinner. When Beppe took the stage to make his speech, there was little warmth or respect emanating from the tables of players who were just next to us. I was amazed that he was still in charge at the start of the season. The fact that he has now left suggests that the Pozzos have found his replacement. Someone described the contrast of the Zola and Sannino reigns as being from a holiday camp to a boot camp. I hope that the new manager is somewhere in the middle. We have a huge amount of talent in this team, with some organization and discipline we could be unbeatable. This entry was posted in Watford FC and tagged Adam Hammill, Alex Smithies, Almen Abdi, Beppe Sannino, Conor Coady, Daniel Pudil, Daniel Tozser, Fernando Forestieri, Gabriel Tamas, Gabriele Angella, Gianni Munari, Harry Bunn, Heurelho Gomes, Huddersfield Town FC, Ikechi Anya, Jack Robinson, Jacob Butterfield, James Vaughan, Joel Ekstrand, Joel Lynch, Jon Stead, Juan Carlos Paredes, Keith Andrews, Murray Wallace, Nahki Wells, Paul Dixon, Radoslaw Majewski, Sean Scannell, Tommie Hoban, Troy Deeney, Watford FC on August 31, 2014 by franelynn.